Asif M. Shaikh is President & CEO of PaxTerra, a recently-established firm focused on emerging markets private equity, trade and professional services. Asif M. Shaikh is President & CEO of PaxTerra, a recently-established firm focused on emerging markets private equity, trade and professional services. He is also Senior Advisor at the Center for Strategic and International Studies (CSIS). He was co-founder of International Resources Group (IRG), and served as its CEO for 22 years, leading IRG to be the first development company ever to be selected for the prestigious Federal Government Contractor of the Year Award in 2004. IRG is a major USAID contractor, implementing over $1 billion of USAID projects in 140 countries during Mr. Shaikh’s tenure as CEO. In December, 2008 IRG was acquired by L3 Communications, a Fortune 200 company, where Mr. Shaikh served as President of IRG and Senior Vice President of L3. He retired from IRG in April, 2013. He is a widely recognized authority on the future drivers of sustainable development, most recently focusing on the issues of interdependent prosperity, donors as minority shareholders in development, and technical innovation as key to development solutions. His work as a business leader, transformational thinker, academic and practitioner encompasses economics, finance, health care, energy, governance, rural development, agriculture, natural resources and poverty alleviation. 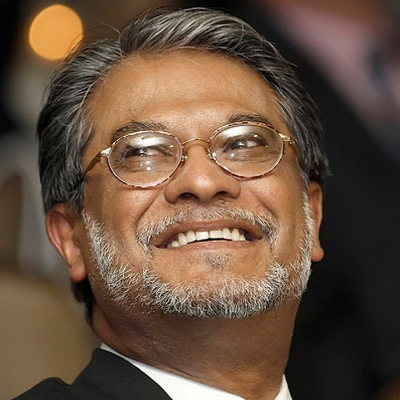 As a thought leader who serves on the Modernizing Foreign Assistance Network (MFAN) and CSIS, and was on the Executive Committee of the US Global Leadership Coalition (USGLC) for six years, Mr. Shaikh’s views are regarded as a key link between policy and practice. He has published extensively and lectured to policy and decision-maker audiences throughout the world. He has led path-breaking field approaches for USAID and other clients in energy, agriculture, food security, governance and national economic policy. His work has had a significant influence on U.S. global development policy as well as on investment strategies throughout the African continent and the developing world. In 2013, Mr. Shaikh received the Society for International Development (the world oldest and largest membership organization for development professionals) Award for Leadership in Development (its highest). He is the only development practitioner ever to be so honored. Mr. Shaikh has worked in both technical and advisory capacities in more than 35 countries in Africa, Asia, Europe, the Caribbean, and North America and brings a practical knowledge of the challenges of and opportunities for collaborating on the ground with donors, foundations and the private sector. He has long been a champion of leveraging commercial capital flows for solutions in development. He has lived in three countries of sub-Saharan Africa for a total of six years, and has undertaken over 100 short-term professional assignments in 25 countries of sub-Saharan Africa. He has extensive work experience in Asia and the Middle East. Mr. Shaikh has served on numerous oversight and policy boards throughout his career, including for USAID, the World Bank, the National Academy of Sciences, OECD/Club du Sahel, CILSS, ECOWAS, the Office of Technology Assessment, FAO, WMO, World Resources Institute and national governments. He interacts extensively with the United States Congress and Administration Officials, and has addressed a meeting of African Heads of State and multiple gatherings of African Ministers. He has participated on panels with each of the last four USAID Administrators. Among his many publications are the highly-acclaimed Nature, Wealth and Power, Opportunities for Sustained Development, and Dynamic Linkages in Population, Environment and Development (Michigan State University Press). In the course of his career, before and since IRG, he participated in several OPIC investment missions to Sudan, led a major manufacturing feasibility study in Algeria and served as Fund Leader and CEO for the Vaud Africa Investment Fund. PaxTerra, Founder, President & CEO, 2015-present. PaxTerra is a US New Business with a 35 year legacy of working for economic growth in emerging markets through private equity, trade and professional services. PaxTerra has an exceptional Management Team, a stellar group of Associates, and outstanding Partner Organizations throughout the world, especially in developing countries. Vaud Africa Investment Fund, 2014. Funder Leader & CEO of a Private Equity Investment Fund before deciding to start PaxTerra. International Resources Group/L3 Communications, 2008-2013. In December, 2008, L3 Communications (a $15 billion, Fortune 200 company) acquired IRG. Served as President of IRG and Senior Vice President of L3 Communications until retirement in April, 2013. Served initially as Director, then as West Africa Director of the Energy Initiatives for Africa Project, US Agency for International Development (USAID), based in Abidjan, Ivory Coast. Traveled extensively throughout West Africa and East Africa. Wrote and lectured extensively at international and domestic conferences, including the African Heads of State Conference in Paris in 1994, The World Bank, the Center for Strategic and International Studies, the Brookings Institution, the Wilson Center, the Carnegie Endowment for Peace, and at Universities, including Yale, Harvard, Columbia, Johns Hopkins, American University, Wageningen University (the Netherlands), the University of Dakar (Senegal) and others. Gordian Associates, Washington, DC: Senior Economist, 1979-1980. Co-led major energy futures studies for Department of Energy, and feasibility studies for private manufacturing company based in Detroit, Michigan. Gordian Associates, New York, NY: Consultant, 1976-77; Economist 1977-78; Senior Economist, 1978-79. Conducted/led major feasibility studies in Algeria, Sudan and Ivory Coast. Co-led major study for Brookhaven Labs on Energy Futures in Developing Countries to 2020. Managed a team of Columbia University economists.